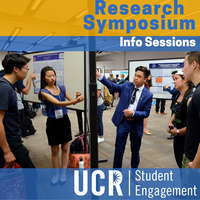 Information Sessions on how to apply to present at the Undergraduate Research Symposium. Students from all majors are invited to apply to present their research as a poster or oral presentation. Creative work presentations, business research plans, and student taught R'Courses are also encouraged to present! Symposium will be held May 14-15 in 3rd Floor HUB. TRACK 1: ORAL PRESENTATION FOR DEVELOPED RESEARCH Oral presentations should represent completed empirical research. This track is open to papers based on completed research studies. Students should be able to clearly present their research question, outline the research methodology and assessment, and present clear outcomes. TRACK 2: POSTER PRESENTATION FOR EMERGING RESEARCH Poster presentations should represent research projects that are not completed but might be of significant interest to the research community. Both conceptually- and empirically-based papers on "work-in-progress" projects would fall into this category. TRACK 3: CREATIVE ACTIVITY Creative activities and performances should represent the final product of a scholarly creative activity. These projects could include, but are not limited to, submissions from Dance, Art, Music, Creative Writing, Media and Cultural Studies, and Theatre, Film, and Digital Production. Students should be able to discuss the research/inspiration behind the final product. Performing and visual arts projects may be presented in the traditional oral or poster format, or as exhibits, displays, performances, readings, and viewings. Consult with your faculty mentor to determine the appropriate venue. Very formative. All my questions were answered.